Highly visible with multiple reflective sheeting options. Available in high- or low- density polyethylene. Worried about cars “barreling” through your construction zone? Fight back with barrels of your own! Traffic safety barrels by Transline are constructed out of dense, heavy-duty plastic, making them tough enough for any job site. They’re bright, safety-orange in color and have space for both mounted lights and five tiers of reflective sheeting. These barrels are all but impossible to miss, which promotes better safety for workers and motorists alike. Our barrels are designed with convenience in mind. The top handles make them easy to carry and move, while molded lugs within each barrel facilitate simple stacking. You’ll save storage space while in transit AND set-up / clean-up time on job sites. And because they’re made of plastic, wood rot or rust won’t be an issue. Transline offers different choices of barrel bases to suit our customer’s unique needs (and budgets). Standard, built-in plastic bases can be weighed down with up to 50 lbs. of sand, or, for additional sturdiness, you can opt for a tire-ring base or one made out of thicker, more solid rubber. Regardless of your desired base, you can select from three different levels of reflective sheeting (engineer-grade, high intensity, or diamond-grade) or no sheeting at all. Use traffic safety barrels to fence off work areas and direct traffic away from closed lanes. When weighed down properly (either with sandbags or a rubber base), the barrels will generally stay where they are placed and will resist minor shifting from the “rumble” of passing vehicles. Please note that, if a traffic barrel is struck with severe force, the plastic body will typically separate from a rubber base; this is a safety feature and NOT a sign of a manufacturing defect. In most cases, plastic barrels warped by impact can simply be molded back into their original shape by hand. 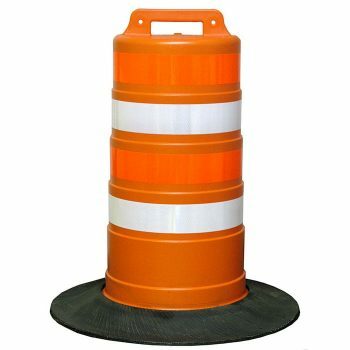 Traffic Safety barrels can be secured with a tire ring, rubber base, or plastic base.